Made from clear acrylic these mills are in the more familiar traditional mill design with a central spindle and threaded end cap. The mills in this set have a convex baluster shape and sit on a beech coloured (hevea) hardwood stand with a bright chromed steel handle. The set is gift packaged in a see through acetate box. Total height is 10 cm high (4 inches) and arrives prefilled with sea salt and black peppercorns. 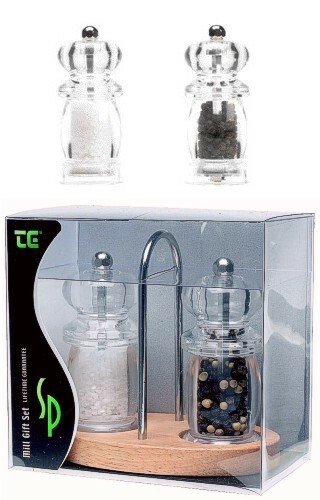 Price is for both salt/pepper mills and stand.